The head speed of a helicopter is the revolutions per minute of the main rotor. Blades acts as a divider. The sensor data received is divided by the blades value. The sensor data received is multiplied by this value. There are a number of ways to configure the system to get the RPM and Head Speed. Set the number of magnetic pole pairs on the RPM Sensor Hardware. In this case the RPM is correct and no corrections are required in the OpenTX RPM Telemetry. Leave the number of magnetic pole pairs on the RPM Sensor Hardware set to 1. In this case the RPM is corrected in the OpenTX RPM Telemetry settings. Use OpenTX Telemetry to calculate and display the Head Speed based on the RPM. Use the Head Speed Lua Script to calculate and display the Head Speed based on RPM. The FrSKY RPM Sensor senses electrical pulses. These pulses are proportional to the number of motor magnet (pole) pairs. The FrSKY RPM sensor can be configured with the number or pole pairs, say 7, so that the RPM value that is reported by the sensor is correct. If the RPM sensor is configured with pole pairs as 1 but the actual pole pairs is say 7 the the RPM value reported by the sensor will be 7 times higher. In this case we account for this by setting blades to 7 so that sensor data is divided by 7. 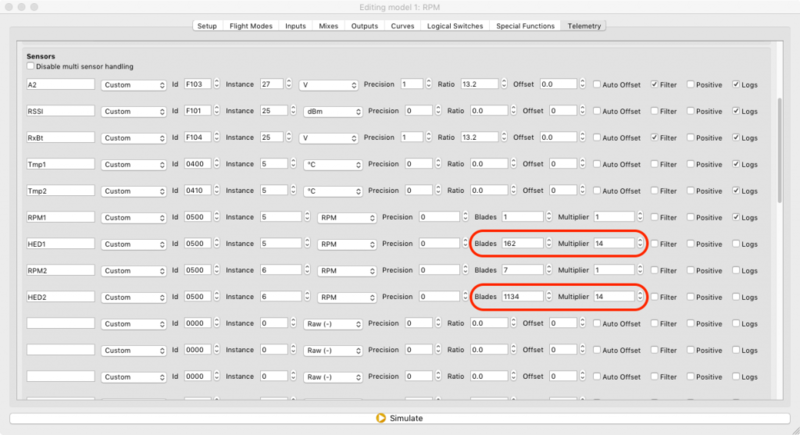 The file has four sensors set up with the values from the examples on this page. RPM1 & HED1 – Use these if the RPM Sensor Hardware has the number of magnetic poles configured and the RPM output is correct. RPM2 & HED2 – Use these if the RPM Sensor has the number of magnetic poles configured as 1 so the RPM output has to be corrected. Open the file using Companion and run the simulator.